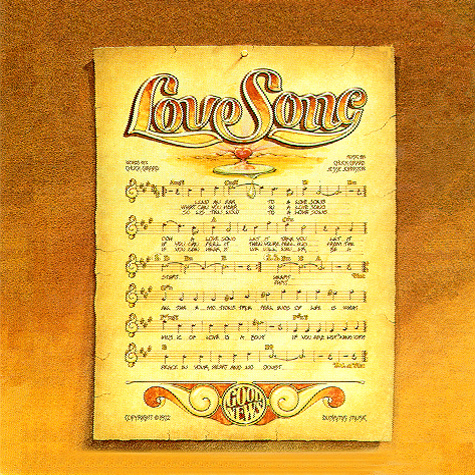 The cover of the first album by the group Love Song simply bore the group name, and an awesome original illustration by Kerne Erickson, depicting classic sheet music and a beautiful graphic of their logo. The cover was an amalgam of two separate ideas. The sheet music idea was suggested by Chuck Girard, and the idea of the logo with the heart coming out of the mountain like a sunset, into a pool of “living water”, was the creation of Jay Truax, an excellent artist in his own right. The group could not agree on a choice between the two ideas, so Kerne went to work on combining them into one. The successful blend of the two images resulted in the iconic cover, and the album inside became the “dna” music for many newly born-again hippie Christians. The back cover photo was taken by Rolland Baker, a friend of Chuck’s wife Karen. It was a very difficult shot taken without benefit of today’s Photoshop technical wizardry. The group stood on boxes in very odd painful positions for hours on end to achieve the symmetrical result. Rolland and Heidi Baker are founders of Iris Global Ministries , and have been living in Mozambique, Africa for many years. The group had a desire to influence the lives of non-Christians as well as Christians, and the first album was distributed by United Artists Records. The actual label which released the album, Good News, was founded by Freddie Piro, after his conversion to Christ in a parking lot at a record company for which he worked while in discussions with the group as to their recording future. Plans were made to begin recording, and the group repaired to a beach house in Malibu, CA to pray about what songs to put on the album, and to do their best to decide a good sequence for the songs. Against conventional practice, they actually sequenced the album before recording. This usually never works out, as finished songs turn out to be different lengths than originally estimated, and because LPs have limited space per side, songs usually have to be re-sequenced after recording to consider these technical aspects. The final song order however, went on the album exactly as they had planned in prayer, an amazing feat. Also noteworthy was the fact that the group had decided beforehand to do no “sweetening”, (strings, horns, etc. ), and to have no fade-outs on the album. The idea was to keep the music as close to the live performance as possible. Tommy Coomes recalls that the group was once approached by the legendary producer Bill Halverson, who had produced/engineered numerous albums for the different iterations of Crosby Stills Nash and Young, Eric Clapton and the Beach Boys, among others. The group decided against using him, as it was not apparent that he was a follower of the Christian faith. The album was engineered by Stan Ross, co-owner of the legendary “Gold Star” studios, in Hollywood, CA, where many radio hits had been recorded over the years. Such Phil Spector classics as the Ronettes “Be My Baby”, The Righteous Brothers “You’ve Lost That Loving Feeling”, and even Love Song member Chuck Girard’s secular radio hits with the group The Castells, “Sacred” and “So This Is Love”, were recorded at Gold Star. Brian Wilson cut many Beach Boys songs at Gold Star, including the classic “Good Vibrations”. Historically, the Love Song album was the last album ever to be recorded on the original tube console, a rotary knobbed affair that was a far cry from today’s mammoth boards. .
Before the recording of the album, two original members, guitarist Fred Field and drummer John Mehler had left the group to form another band. Bob Wall replaced Fred Field, but Love Song was now without a drummer, and as Tommy Coomes recalls, they first tried to record the album in a kind of “un-plugged” style, sans drummer. It soon became obvious that this was not going to work, and a young session drummer, John Raines, was hired to drum on the project. The album was first mixed with Stan Ross at the controls. The album had a lackluster sound, with not much brilliance and sonic range. The group was unhappy with the result. Freddie Piro had been in talks with a young engineer who had made a reputation by recording and mixing Paul McCartney albums. His name was Eirik Wangberg,and he had a nickname "Eirik the Norwegian".He took the tapes to a studio he liked, Sound Studios in Hollywood. His mix was so much better, and that was the version that ended up being the album. The album was the last album recorded at Gold Star Studios on the famous old recording board. After the album was recorded, they pulled out the old board and upgraded to a new more modern board. They were out of business in a few years after that. The studio is no longer there, and the famous echo chambers were cemented in. Today a convenience store occupies that space. The group was finally happy with the result, and the album was released in the first half of 1972. It sold about 30,000 copies under the distribution system of United Artists, but these numbers fell short of expectations. One problem was that UA did not know how to service the small Bible book store orders which were the backbone of gospel music sales. A Christian secretary at UA took to collecting the unfilled orders, and gave them to Mike McIntosh, a Calvary Chapel pastor who had set up an ad-hoc distribution hub in his garage. Mike serviced the orders that UA could not. Shortly after, Freddie Piro made a new distribution deal with Myrrh Records, a division of Word Records in Waco, TX, and the album sold 70,000 more units in a few short months. Over the life of the album, it sold over 300,000 units, unheard of numbers for a contemporary Christian album of that time. It was actually voted “Album Of The Year” in the trade publication “Bible Bookstore Journal” and it wasn’t even on the ballot! After the listed choices on the ballot, there was a box for “other”. The Love Song album won by voters writing it in that category.